“We scrub the floors, we cook the meals, we raise the children — why aren’t we good enough to stay?” asked Eulene Boyce, a West Indian domestic worker. 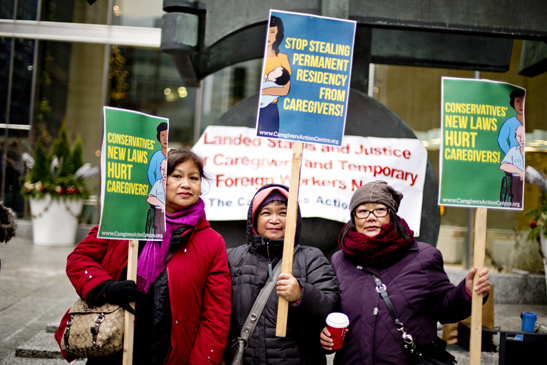 Domestic workers of colour from the Caribbean and the Philippines started arriving in the late 40s, and unlike their white counterparts were largely denied citizenship rights. 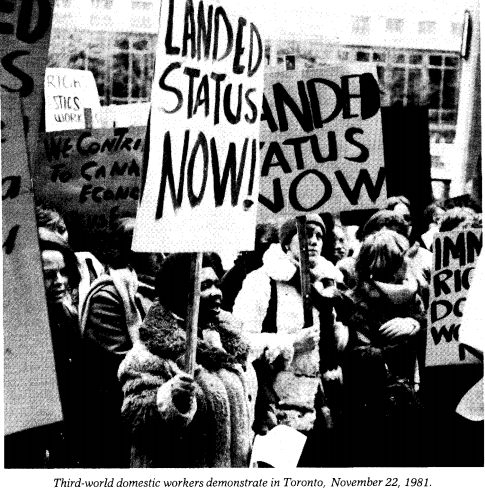 Following the end of White-only immigration policy in 1967, new policies were created in 1973 that denied permanent residency to domestic workers. 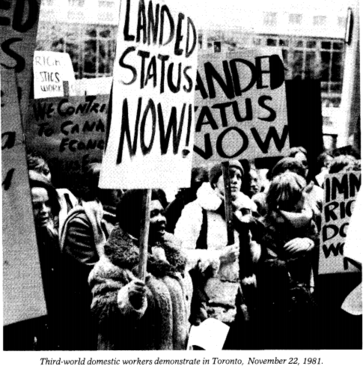 1973 was the also the year when the roots of the current Temporary Foreign Worker Program were laid. Thus the creation of the “temporary” migrant worker programs were at their very core a policy rooted in racist exclusion. And that’s exactly where the clock is being turned to today. The shutting out of thousands of racialized women from permanent immigration status is being strangely spun as a step forward. Immigration Minister Chris Alexander insisted, “We are saying to the whole Canadian population, to caregivers above all, the time of abuse and vulnerability is over”. The policies coming into force are accompanied by Harper and Alexander acceding to a long-term demand of Caregivers — the forced requirement to live in employers homes is now voluntary. 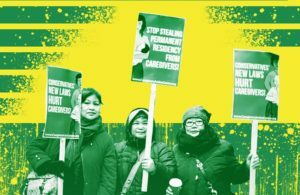 Even though Caregivers won the right to permanent residency in 1981, the fight hasn’t entirely been won. Excessive requirements were placed on those applying for residency. A series of intense organizing efforts led to the easing of some of these restrictions but permanent residency is still difficult to access. Restrictive and exclusionary provincial laws add to the injustice, denying protections from recruiters, health and safety benefits and access to effective protections from reprisals to Caregivers who are on provisional temporary immigration status for 4-10 years. Its important to analyze the key arguments being made about the TFWP. 1: Migrant workers are pushing Canadians out of jobs and taking jobs from unemployed Canadians. News outlets and commentators have reported how the total numbers of migrant workers entering the country make up one quarter (some say three quarters) of new jobs created in Canada, thus suggesting that migrant workers are taking jobs from young workers. The news media is full of a few cases where migrant workers are replacing citizen workers. This is missing the forest for the trees. There were between 76,711 – 230,379 low-skilled migrant workers in Canada at the end of 2012 — making them 0.0042 per cent — 0.013 per cent of the labour force (the large discrepancy between the figures is because 153,668 workers’ occupational classification is not reported on by Immigration Canada). Of these about 35,000 worked in the agriculture sector, while another 19,830 were live-in caregivers. There are officially 1.35 million unemployed Canadians in the country (real unemployment is likely twice as high). Even if all migrant workers were excluded there would be at least 1.1 million unemployed Canadian citizens left. Communities with the highest levels of unemployment — like Nunvaut — have relatively few migrant workers. And regions with the lowest rate of unemployment — that is Alberta — has the highest number of migrant workers coming in. There is no generalized replacement of citizen workers by migrant workers. Add to that its well know that migrant workers are often replacing other migrant workers — like on southwestern Ontario farms where migrant workers have been coming since the mid-1960s. Secondly, migrant workers are often coming in to jobs that were previously also occupied by new immigrants – these are the low-paying jobs in gas stations, retail and manufacturing that newcomers work in to get a leg-up. It’s the same demographic of people — racialized, young and middle-aged newcomers — who are working these jobs. Except now, they will be deported after a few years rather than build a life here. Immigrants have always formed a critical part of Canada’s workforce — only now they are here temporarily. There is absolutely no evidence that says that shutting out migrant workers would mean that employers would hire young Canadian citizens. That’s because there is a major disconnect between labour, education and training policy in the country. What is needed is government support for skills training, as well as income security — not migrant worker exclusion. The only reason migrant workers can be paid less, and exploited more is because of two-tiered federal and provincial laws, and legal limitations on collective organizing. In Ontario, for example, provincial law excludes many migrant workers fromminimum wage, occupational health and safety guarnatees, and even the landlord-tenancy act protections based on their occupational classifications. Shutting down the TFWP would not mean that the employers would immediately raise wages for Canadian workers. Lobbyists for fast-food restaurants like McDonalds, for example, have been advocating against minimum wage increases in Ontario. They might choose to move jobs to other regions in the world, to advocate for moregovernment subsidies and tax cuts , or to pass down increased costs to consumers, or do all of the above. Many argue that migrant workers cause a downward pressure on wages and work conditions — therefore uplifting and empowering them is the only way to improve conditions for all. Migrant workers are less likely to stand up to abuse because they have more to lose when speaking out. The real culprit here is the law that ties migrant workers to an employer, and gives employers immense power to deport people at whim. The simple solution to that then is full immigration status on landing which would remove the coercive power employers and recruiters hold. It’s also important to note that despite these limitations, migrant workers have organized, including mass rallies, speaking out against recruitment fees , fighting back against employer abuse and more. At a time when all the provinces are cutting resources from labour departments responsible for keeping corporations in check, abuse already encompasses citizen workers. It’s not about abolishing the TFWP, it’s about ensuring real labour protections for all. 4: Corporations are breaking the law by hiring temporary foreign workers. Many have said that the temporary foreign worker program is being used illegally. That the TFWP is supposed to be a short-term labour shortage fix, and employers are making it otherwise. This is a profound misunderstanding of Canadian and global immigration policy. Since 1978, more people have entered Canada on a temporary basis then on a permanent basis. This is not a new story, and there is no simple solution — like shutting down the TFWP. Since Harper came in to power in 2006, temporariness has been entrenched throughout the immigration system. It’s not just that there are more temporary migrant workers, now parents, grandparents and spouses also come in temporarily.Refugees and permanent residents face many different ways where their status can be revoked — making them also temporary. This is the new global face of immigration with most “countries” expanding their guestworker programs, a regime that is being pushed at the United Nations level. The entire immigration system — not just the temporary foreign worker program — is determined by corporate interests. The new expression of interest system is controlled by employers. Referred to as an “online dating” system, employers cherry pick from immigrant applicants to fast-track who can come here permanently. Only workers from 24 occupations can apply. Corporations aren’t breaking the intent of the law. Temporary immigration is the law of Canada and the global norm. The solution is not to slam the door shut on migrant workers. Or even, as some progressives insist, to simply expand the permanent immigration system. That would just mean more corporate-driven immigration. Poor and racialized workers (so-called “low-skilled workers”) that make up the TFWP, must be able come to Canada freely with full immigration status on landing, including the ability to reunite with their families. We need to openly contest the factors that force people to move, and create systems of migration that are people, not corporate-driven. We need status for undocumented migrants now. Unlike stories of the deaths of migrant workers like Ned Peart,healthcare denial,racist policing, or mass exploitation like in the Presteve Case, it seems to be that its only stories pitting migrants against “Canadians” that get national attention. The use of incorrect statistics and skewed economic arguments to demand the exclusion of Temporary Foreign Workers by people all along the political spectrumhearkens to a lengthy history of exclusion of immigrants from Canada. While in the past racist headlines read “Immigrants are taking Canadian jobs,” now they insist “Foreign workers are taking Canadian jobs.” What’s the difference? There is more afoot here, its xenophobia and it must be challenged. It is important that we do not repeat the injustices of the past. Full immigration status for all, full rights for all workers is the only way forward. Resist attempts to divide unemployed, migrant, and poor people. On behalf of the Migrant Workers Alliance for Change (MWAC), I appreciated the opportunity provided by the Canadian Labour Congress, to attend the recent meetings in New York City in and around the UN High Level Dialogue (HLD) on Migration and International Development. I spent my time between the two outside events: the People’s Global Action (PGA) on Migration, Development, and Human Rights, and the International Assembly of Migrants and Refugees (IAMR 4). 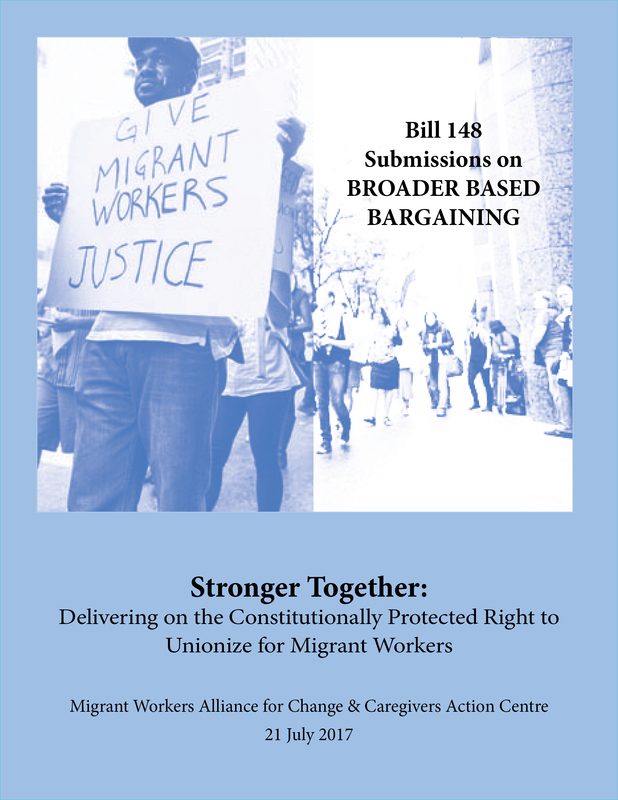 12 recommendations to end migrant and undocumented worker poverty in Ontario. The Government of Ontario is organizing a consultation on its poverty reduction strategy.Community groups have long demanded good jobs, a liveable income, minimum wage increases, and a raise in social welfare rates to pull Ontarians out of poverty. Communities need and demand decent transit, strong public programs and a commitment to social justice and equity. Many insist that Ontario must invest resources and set targets that reduce poverty for everyone, prioritizing children, families, and communities, not austerity. 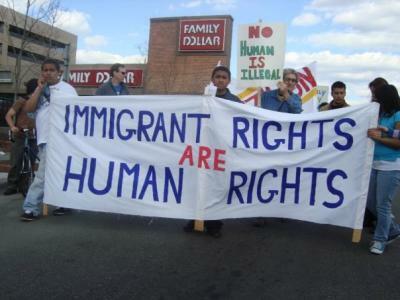 We at the Migrant Workers Alliance for Change Agree. But we know that most of the 350,000 Ontarians who are migrant workers and undocumented people don’t get minimum wage, overtime pay, OW, ODSP, social housing, full healthcare or social service programs. Few migrant and undocumented workers can reunite with their families, and those that do are denied the most basic rights and protections. Ontario must do more to end migrant and undocumented workers poverty. Today is the International Migrants Day. On Dec 18, 1990, 22 years ago, the UN passed the International Convention on the Protection of the Rights of All Migrant Workers and Members of Their Families. No migrant-receiving country, including Canada, has ratified this convention. Just last week, Federal Human Resources Minister Finley took away special E.I. benefits from migrant workers through a quiet Thursday afternoon regulatory change. She did this assuming that most people wouldn’t notice. Just to add insult to injury, she cut these benefits that were won after years of protest by the women’s movement, on December 6 — the National Day of Remembrance and Action on Violence Against Women. This isn’t just a mean-spirited move, or a lump of coal as a Christmas gift to migrant workers as theToronto Star notes, it is part of a long-term strategy to take away basic support from all unemployed workers, irrespective of immigration status. Migrant workers, seen as the most vulnerable, are just the test case. If these benefits aren’t restored, and E.I. not expanded for migrant workers now, the axe on all E.I. benefits for all workers will fall far more swiftly and painfully then it already has. 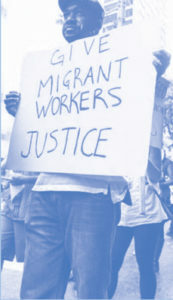 Just in 2008, migrant workers and their employers paid an estimated 300-million dollars in to E.I. but were only able to access some paternal, maternal and compassionate benefits. Now even that has been made off-limits. This while, the numbers of temporary workers contributing in to E.I. premiums has gone up by nearly 17 per cent since 2008. This theft of migrant workers’ hard earned money takes place in a year where Canadians laws are already stacked up against them. In Canada, it is legal to pay migrant workers 5-15 per cent below the average — a total jettisoning of the age old consensus of equal pay for equal work. Recruiters run amok, charging migrant workers thousands of dollars while provincial laws do little to end this exploitation. Migrant workers are often unable to get full social services or access basic health, and safety protections. Those that fall sick or complain face deportations. Adriana Paz Ramirez, an organizer for Justicia for Migrant Workers agrees, adding “For over 40 years migrant workers have been subsidizing Canada’s E.I. fund yet have been ‘ineligible’ to receive full benefits, and now they are being completely stripped away from the few special benefits they were able to access. This is completely unjust and outrageous.” (See Justicia’s call for actions, including a vigil in Toronto today, here). The Canadian parliament isn’t exactly the pinnacle of democratic process right now (case in point: the massive budget bill that was pushed through Commons earlier last week despite immense opposition), but it must be noted that the banning of migrant workers from E.I. benefits they paid for happened without being discussed in the Commons. Much of public policy is being set by press release and through decisions summarily announced on the government’s online website. Remember how tens of thousands of refugees had their healthcare cut — that was a regulatory change. You know how women are forced to stay in marriages for two years to get citizenship — regulatory change. Harper’s Ministers have been summarily amassing powers for themselves. Jason Kenney, one of the key architects of our current temporary immigration system, has given himself unilateral power to decide which refugees should be indefinitely jailed and which shouldn’t. Trying to keep up with him, Minister of Human Resources and Skills Development Diane Finley has amassed special powers for herself to define what constitutes “suitable employment” for E.I. claimants, and to define “reasonable and customary efforts” to find work. Claimants can be cut off benefits if they decline “suitable employment” and do not make “reasonable and customary efforts” to find work. This includes taking jobs at wages 30 per cent below what they were previously earning. The expansion of the temporary foreign workers program, theft of E.I. benefits from migrant workers and Canadian citizens alike, are all part of one “cheap labour” strategy. Diane Finley and Kenney think they can get away with this program, simply because no one is paying attention, the question is, are they right? Soon after the E.I. changes were announced, migrant worker organizing escalated. Migrant workers themselves organized an educational seminar for non-migrant workers about the impact of these E.I. cuts in Southern Ontario, while many MWAC members issued statements and organized actions. 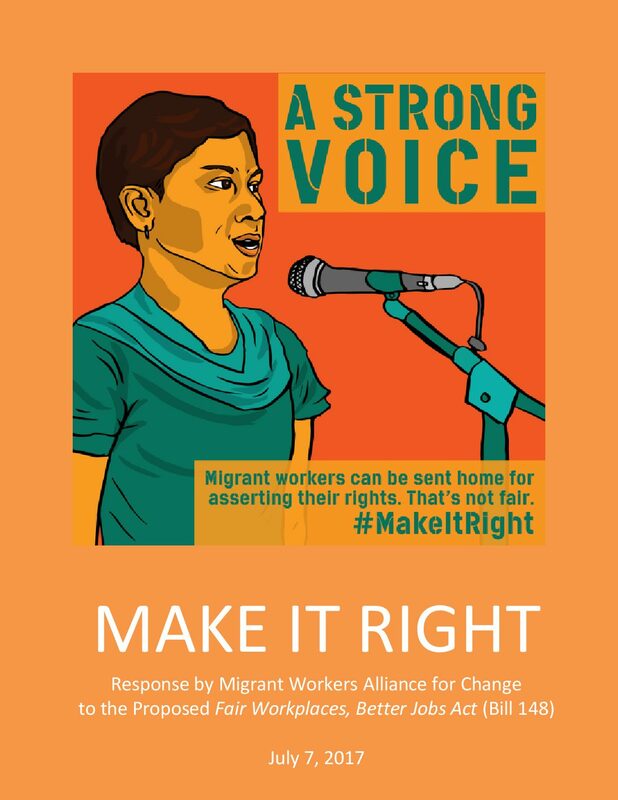 Migrant workers and their allies are demanding justice, status, dignity and full rights, and we are creating those as a reality in our communities.